OK, I’m fully aware that this sounds weird. Slightly grotesque. Morbid. The way I confront death might be the last thing that others want to do… But I think it’s important to accept death as a natural part of life. And rather than me being haunted by the fear that cancer would return, I thought: isn't it better to face up to what I'm actually worried about? When I was first diagnosed, I was full of fear. At the doctor’s words 'You have cancer', I immediately thought, that’s it, my time is up. Was I the only one who immediately thought they’d die right then and there? As time passed and I went into remission, my thoughts about death became more generalised, and not exclusively focused on cancer. The Fear was following me and I felt almost paralysed by it. 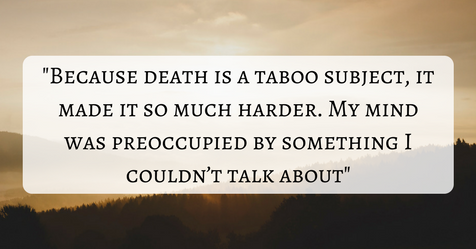 Because death is a taboo subject, it made it so much harder. My mind was preoccupied by something I couldn’t talk about, because people are so scared of it. So instead of avoiding the topic, I decided to try a new peculiar approach to dealing with it. Because I cannot talk about it, I try to normalise death in my mind. I try to remind myself that it happens to us all and it’s a consequence of being human. I’m interested in films that show the death of main characters, those that you really empathise with. There’s far fewer films that show the death of a main character. I stay clear of stories with huge sentimentality. I am more interested by how characters cope with it. How do they brave up to it? I’m less keen reading fictional books as description can put grief in a little too much of a sharp focus and writers tend to focus on the experiences of those left behind rather than the experience of the dying. Books written by people centuries ago, this helps normalise mortality. Reading their words makes me feel close to them, even though they died a long, long time ago. I’m not a religious person, but reading their stories gives me a hope that people live on in other ways -through memories and their actions. The same could be said for musicians, it is fascinating how melodies and lyrics can travel through time and have such an impact on the living. As death is going to happen to all of us, I think that rather than be paralysed by the fear of it, it’s better to try to accept that life doesn’t go on forever. Hiding from it doesn’t help me as I feel like I’m repressing a fear that took over my life when I was diagnosed. I don’t think this is healthy. So I’m not sure if this is helpful to others, but this is one of the ways I deal with the fear. I try not to be scared of death, by opening my thoughts to it and desensitising my feelings. As a person who has walked the line of life and death a surprising number of times I can say that it was only after becoming the caregiver of my sister who died from breast cancer that I have come to really accept my own mortality. As in many things in our lives she taught me how to come to peace with death as part of our journey. We may not have control over the quantity but we absolutely have control over the quality. Every morning I am thankful for another day. I am grateful for what I have and this helps me realize I should make the most of each day as life is precious. Each day I'm also reminded that cancer can come back, it spoils my optimism as it daily brings fear. I don't know if that feeling will evere recede.